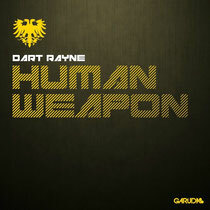 21-year-old Ukrainian DJ and producer Dart Rayne releases his Garuda Music debut this week with his new track ‘Human Weapon’. Already a set favourite by Garuda boss Gareth Emery himself, the track debuted on TGEP 244 and has proved really popular since. Extensive big-room builds layered with sharp snares set the tone immediately, giving the track a nice uplifting feel. "I was trying to make something new for me," Dart Rayne said. "As I start to play the biggest festivals I wanted to create big room music, and that's why I made ‘Human Weapon’!" In his few short years in the scene Dart Rayne, aka Andrey Krutikov, has been on a mission to put his home country on the map in the progressive and trance world. So far he’s been successful, becoming the first Ukrainian to be awarded "Tune Of The Week" on ASOT and featured on the mix compilation ‘In Search of Sunrise’. He’s also been performing at events like Global Gathering, Godskitchen, Armin World Tour and more, and has seen huge support from the likes of Hardwell and W&W. Check it out below, it’s out now.